3. A network administrator is asked to design a system to allow simultaneous access to the Internet for 250 users. The ISP can only supply five public IP addresses for this network. What technology can the administrator use to accomplish this task? 4. Refer to the exhibit. An administrator is configuring NAT to provide Internet access to the inside network. After the configuration is completed, users are unable to access the Internet. What is the cause of the problem? The NAT pool is using an invalid address range. The inside and outside interfaces are backwards. The ACL is referencing the wrong network address. 5. What is the expected behavior of an ADSL service? The upload rate is faster than the download rate. The download and upload rates are the same. The user can select the upload and download rates based on need. 6. A network administrator is troubleshooting the dynamic NAT that is configured on router R2. Which command can the administrator use to see the total number of active NAT translations and the number of addresses that are allocated from the NAT pool? 7. Which type of traffic would most likely have problems when passing through a NAT device? 8. Refer to the exhibit. The inside local IP address of PC-A is 192.168.0.200. What will be the inside global address of packets from PC-A after they are translated by R1? 9. Refer to the exhibit. What kind of NAT is being configured on R1? 10. What benefit does NAT64 provide? 13. 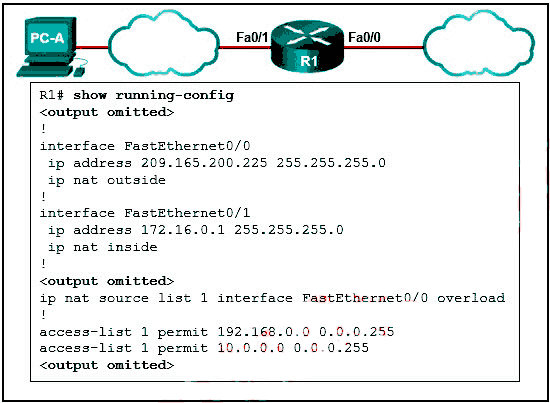 Which command can be used to check the information about congestion on a Frame Relay link? What is the effect of these commands? The NCP will send a message to the sending device if the link usage reaches 70 percent. The LCP establishment phase will not start until the bandwidth reaches 70 percent or more. The PPP link will not be established if more than 30 percent of options cannot be accepted. 15. Refer to the exhibit. A network administrator has implemented the configuration in the displayed output. What is missing from the configuration that would be preventing OSPF routing updates from passing to the Frame Relay service provider? The passive-interface command has not been issued on interface serial 0/1/0. The directly connected neighbor should have been identified by using static mapping. The command to disable split horizon has not been issued. 16. What is a characteristic of Frame Relay that allows customer data transmissions to dynamically “burst” over their CIR for short periods of time? The combination of LMI status messages and Inverse ARP messages enables the CIR to be exceeded. Bursting is enabled by the configuration of multiple subinterfaces on one physical interface. BECN and FECN messages notify the router that the CIR can be exceeded. 17. Which broadband technology would be best for a small office that requires fast upstream connections? 18. What is the protocol that provides ISPs the ability to send PPP frames over DSL networks? 19. Which technology requires the use of PPPoE to provide PPP connections to customers? 20. Why is it useful to categorize networks by size when discussing network design? Knowing the number of connected devices will define how many multilayer switches will be necessary at the core layer. Knowing the number of connected devices will define how many additional layers will be added to the three-tier hierarchical network design. A high-level redundancy at the access layer may be better implemented if the number of connected devices is known. 21. A company connects to one ISP via multiple connections. What is the name given to this type of connection? 22. What is one advantage to designing networks in building block fashion for large companies? 23. Which network module maintains the resources that employees, partners, and customers rely on to effectively create, collaborate, and interact with information? 25. A team of engineers has identified a solution to a significant network problem. The proposed solution is likely to affect critical network infrastructure components. What should the team follow while implementing the solution to avoid interfering with other processes and infrastructure? 26. Which troubleshooting tool would a network administrator use to check the Layer 2 header of frames that are leaving a particular host? R1 will not send critical system messages to the server until the command debug all is entered. R1 will reset all the warnings to clear the log. R1 will output the system messages to the local RAM. The connectivity between these two hosts allows for videoconferencing calls. The average transmission time between the two hosts is 2 miliseconds. This host does not have a default gateway configured. 30. 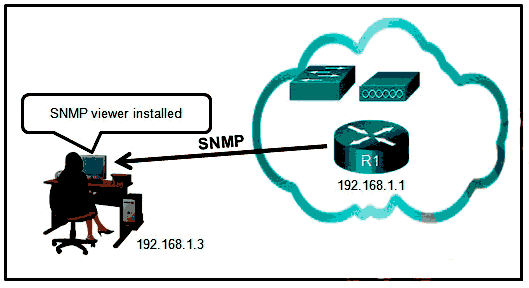 Which statement is a characteristic of SNMP MIBs? The MIB organizes variables in a flat manner. The SNMP agent uses the SNMP manager to access information within the MIB. The MIB structure for a given device includes only variables that are specific to that device or vendor. The snmp-server enable traps command is missing. The snmp-server community command needs to include the rw keyword. The snmp-server location command is missing. 32. What is used as the default event logging destination for Cisco routers and switches? 33. In the data gathering process, which type of device will listen for traffic, but only gather traffic statistics? 34. Which SNMP message type informs the network management system (NMS) immediately of certain specified events? 36. Which algorithm is considered insecure for use in IPsec encryption? 37. Which statement describes a characteristic of dense wavelength division multiplexing (DWDM)? It supports the SONET standard, but not the SDH standard. It enables bidirectional communications over one pair of copper cables. It assigns incoming electrical signals to specific frequencies. 38. Two corporations have just completed a merger. The network engineer has been asked to connect the two corporate networks without the expense of leased lines. Which solution would be the most cost effective method of providing a proper and secure connection between the two corporate networks? 39. Refer to the exhibit. Which IP address is configured on the physical interface of the CORP router? 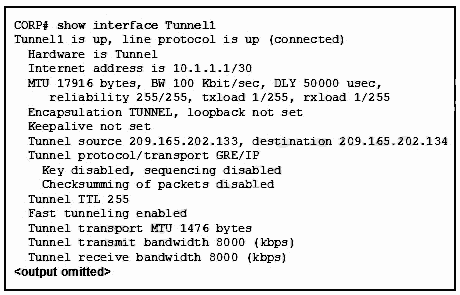 Developed by the IETF, GRE is a secure tunneling protocol that was designed for Cisco routers. GRE uses AES for encryption unless otherwise specified. GRE provides encapsulation for a single protocol type that is traveling through the VPN. 41. Which WAN technology can serve as the underlying network to carry multiple types of network traffic such as IP, ATM, Ethernet, and DSL? Remote access VPNs are used to connect entire networks, such as a branch office to headquarters. End users are not aware that VPNs exists. A leased line is required to implement remote access VPNs. 43. Which circumstance would result in an enterprise deciding to implement a corporate WAN? 46. What term is used to identify the point where the customer network ends and the service provider network begins? Bandwidth is allocated to channels based on whether a station has data to transmit. Encoding technology provides high data throughput in a minimum RF spectrum by supporting parallel data transmission. Depending on the configured Layer 2 protocol, data is transmitted across two or more channels via the use of time slots. 48. A branch office uses a leased line to connect to the corporate network. The lead network engineer confirms connectivity between users in the branch office, but none of the users can access corporate headquarters. System logs indicate that nothing has changed in the branch office network. What should the engineer consider next to resolve this network outage? The network technician for the branch office should troubleshoot the switched infrastructure. The system administrator in the branch office should reconfigure the default gateway on the user PCs. The server administrator in the branch office should reconfigure the DHCP server. 50. Refer to the exhibit. A network administrator discovers that host A is having trouble with Internet connectivity, but the server farm has full connectivity. In addition, host A has full connectivity to the server farm. What is a possible cause of this problem? The router has an incorrect gateway. Host A has an overlapping network address. Host A has an incorrect default gateway configured. Host A has an incorrect subnet mask. 51. Refer to the exhibit. H1 can only ping H2, H3, and the Fa0/0 interface of router R1. H2 and H3 can ping H4 and H5. Why might H1 not be able to successfully ping H4 and H5? Router R1 does not have a route to the destination network. Switch S1 does not have an IP address configured. The link between router R1 and switch S2 has failed. Hosts H4 and H5 are members of a different VLAN than host H1. 52. What is required for a host to use an SSL VPN to connect to a remote network device? VPN client software must be installed. A site-to-site VPN must be preconfigured. The host must be connected to a wired network. 53. What type of information is collected by Cisco NetFlow?